Make sure you always look your best. 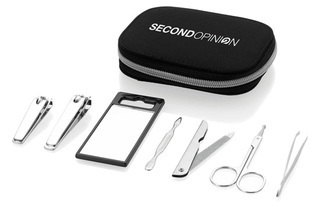 This set includes a mirror, tweezers, a nail clipper, a toe nail clipper, a pair of scissors, a nail file and a cuticle tool. The set comes in a handy non-woven zippered nylon pouch. Stainless steel.